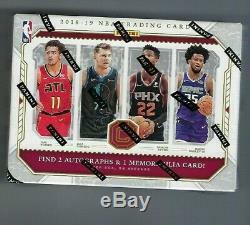 2018-19 Panini Cornerstones Basketball Hobby Box. 2 base or parallels, 1 PVC insert, 2 autos, and 1 memorabilia card per box on average! Look for the popular Rookie Cornerstones cards with four jersey swatches and an on-card autograph! Base #d/199, Crystal #d/75, Quartz #d/49, Marble #d/10 and Onyx #d1/1! Chase the Franchise Pillars autograph cards in the following formats - Base #d/129, Crystals #d/49, Quartz #d/25, Marble #d/10 and Onyx #d/1! Locate the elusive Memorabilia Super Prime containing hard-to-find game-worn jersey tags from the NBAs top players all #d/1! Find the highly sought-after Downtown insert cards, boasting great graphics from the players cities! The item "2018-19 Panini Cornerstones Basketball Factory Sealed Hobby Box" is in sale since Wednesday, March 20, 2019. This item is in the category "Sports Mem, Cards & Fan Shop\Sports Trading Cards\Basketball Cards". The seller is "scsmkm" and is located in Dows, Iowa. This item can be shipped to United States, Canada, United Kingdom, Denmark, Romania, Slovakia, Bulgaria, Czech republic, Finland, Hungary, Latvia, Lithuania, Malta, Estonia, Australia, Greece, Portugal, Cyprus, Slovenia, Japan, China, Sweden, South Korea, Indonesia, Taiwan, South africa, Thailand, Belgium, France, Hong Kong, Ireland, Netherlands, Poland, Spain, Italy, Germany, Austria, Bahamas, Israel, Mexico, New Zealand, Philippines, Singapore, Switzerland, Norway, Saudi arabia, United arab emirates, Qatar, Kuwait, Bahrain, Croatia, Malaysia, Brazil, Chile, Colombia, Costa rica, Dominican republic, Panama, Trinidad and tobago, Guatemala, El salvador, Honduras, Jamaica, Antigua and barbuda, Aruba, Belize, Dominica, Grenada, Saint kitts and nevis, Saint lucia, Montserrat, Turks and caicos islands, Barbados, Bangladesh, Bermuda, Brunei darussalam, Bolivia, Ecuador, Egypt, French guiana, Guernsey, Gibraltar, Guadeloupe, Iceland, Jersey, Jordan, Cambodia, Cayman islands, Liechtenstein, Sri lanka, Luxembourg, Monaco, Macao, Martinique, Maldives, Nicaragua, Oman, Peru, Pakistan, Paraguay, Reunion, Viet nam, Uruguay.